Science Friday – Scared of Thunder | What is ML Reading? I confessed to ML thunder scared me as a little girl. She thinks I’m still afraid. 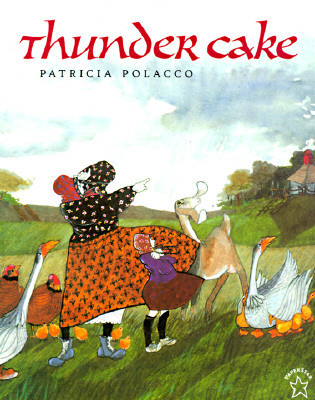 During a thunderstorm last weekend, we read a book about a little girl’s fear of thunder in Thunder Cake by Patricia Polacco. The grandmother helps her granddaughter overcome the fear of thunder by making her a Thunder Cake. With the storm rumbling miles away, they gather the ingredients for the cake. . .eggs from the chickens . . . milk from the cow. . .chocolate, sugar and flour from the dry shed. Then, the secret ingredients “three overripe tomatoes and some strawberries.” ML’s response, “Mmmm that cake sounds good.” We love tomatoes so the secret ingredient works for us. I’ll let you know how it tastes. While reading the tornado section, ML said, “We’re lucky the tornado did not destroy our house.” She’s right. A few years ago the weather was ominous. It was the first time ML was old enough to understand tornado watches and warnings. We made a plan. Our pillows were in the bathtub when her dad called to let us know a tornado was spotted in our area of town. We crouched in the bathtub covered in pillows until her dad called my cell phone to tell us all was safe. Three houses down from our home was a gate for the Oakwood Cemetery. A historic cemetery with lots of beautiful oak trees. Many of them fell in the storm. ML’s observation is correct. We were lucky. 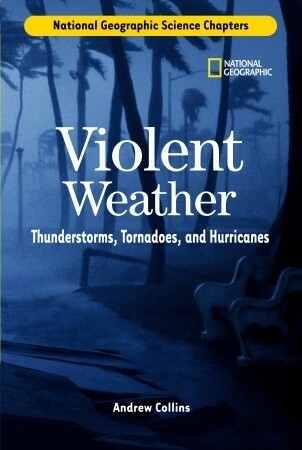 This entry was posted in Nonfiction Book, Picture Book and tagged Andrew Collins, Fear of Thunder, Historic Oakwood Cemetery, Patricia Polacco, Thundercake, Violent Weather: Thunderstorms Tornadoes and Hurricanes by mlreads. Bookmark the permalink.